Jamshedpur: A man-made lake hosting migratory birds from Siberia is the last thing you expect to see as you drive down to India’s largest integrated steel plant in Jamshedpur, Jharkhand. Tata Steel’s initiatives, especially in Jamshedpur, helped it win the Sustainability Award in the large business category for the third year in a row. Instituted by industry lobby Confederation of Indian Industry (CII) and conglomerate ITC Ltd, the awards recognize exemplary performance by Indian businesses in exploring ways to grow and prosper in a manner that protects the interests of business as well as those of society. /Content/Videos/2008-12-16/1512_Tata Steel pkg_Jamshedpur_MINT_TV.flv98fe7c9a-caca-11dd-a6ff-000b5dabf636.flvEmployee welfare is at the core of all initiatives, says Satish Pillai, chief, corporate sustainability services at Tata Steel. “We first think of how to rehabilitate displaced communities, giving them a healthy environment before undertaking mining and other activities." Eight-hour work days, paid maternity leave and public provident fund were in place 20 years before they became legally mandatory in the country. “Safety remains an overriding concern with a target of bringing down LTIF (loss to injury frequency) on plant sites from the current 1.7 to 0.4 by 2012," says O.B. Krishna, chief, safety and ergonomics. Environment-friendly: Tata Steel’s Jamshedpur plant. The company is investing more in technologies that help in controlling pollution. Accidents due to negligence of helpers who came in with drivers and contractors of trailers and trucks were minimized by using specially recruited teams that took over as certified helpers. Positioned in groups during loading and unloading, they made the concept of “helperless driving" possible. “While process safety is a serious issue and one where continuous R&D (research and development) takes place, behavioural safety is more challenging," says Krishna. “When people start identifying risks and ‘think safety’ is when the plant will be sustainable for another century." Analysts say that having its own iron ore mines and collieries has helped Tata Steel retain competitive advantage in raw materials. 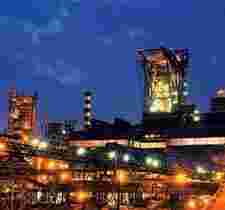 The Jamshedpur plant has achieved self-sufficiency in iron ore requirements, thanks to Tata Steel’s captive mines in Joda in Orissa and Noamundi in Jharkhand, they add. The company is seeking mining leases to support greenfield projects in Orissa, Chhattisgarh and Jharkhand. A recent $2.3 billion expansion and modernization programme has made Tata Steel one of the lowest-cost steel producers in the world, analysts say. They also add that the acquisition of Corus Group Plc. in 2007 and Millennium Steel (which was renamed as Tata Steel Thailand) and NatSteel Asia before that will help the combined entity work towards achieving greater raw material security for global operations through coal projects in Mozambique, an iron ore project in Cote d’Ivoire and a limestone project in Oman, thereby insulating Tata Steel from market forces currently dominated by select companies. Tata Steel is investing more in technologies that help in controlling pollution and reduce dependence on raw material. Capital investment in pollution controlling technologies went up from Rs323 crore in 2002-03 to Rs936.5 crore in 2007-08, says Shashi Bhushan Prasad, head, environment, occupational health and safety, at Tata Steel. The company’s energy consumption has decreased from 8,717Gcal (giga calories) per liquid tonne of steel in 1996-97 to 6,655Gcal in 2007-08. These reductions contribute to sustainability by lowering cost of mining, transportation and production. Avoiding coal burning and utilizing 85.43% waste demonstrate commitments that go beyond statutory compliance, Prasad said. Receiving the Deming Application Prize awarded by the Japanese Union of Scientists and Engineers, “amongst other things, gave us the confidence to be more predictive about performance", says Avneesh Gupta, chief, total quality management. Meanwhile, Tata Steel’s community engagement has graduated from philanthropy to partnership mode in the last 100 years. At least 900 villages surround the company’s operations in the states of Jharkhand, Orissa and Chhattisgarh. According to Pillai, a project launched by the Tata Steel Rural Development Society (TSRDS), corporate non-government organization of Tata Steel, has become self-sustaining in five years. In Patamda block, 25km from Jamshedpur, agriculture extension activities were introduced in seven clusters. Dadan Singh, general secretary, TSRDS workers’ union and agriculturist, says: “Water harvesting, solar energy, watershed development, investing in pump sets, machines for harvesting, mini rice hollers and portable husk cutters benefited 2,000 villagers." Savdhan Baske, secretary of Cluster I project, says the average income of farmers went up from Rs25,000 to Rs1.5-2 lakh over the past five years. “All they want to know is if their produce will have a ready market. They rely on us for support, advice and timely intervention."